Good day to take off? 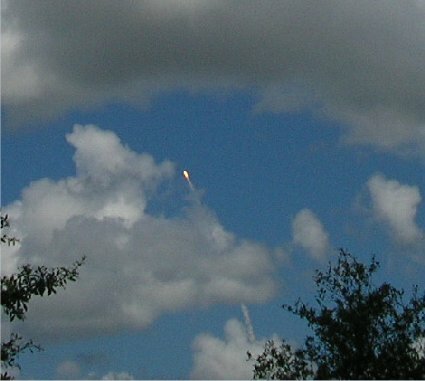 Update 3:01pm ET: What a greatÂlaunch for the 4th of July!Â HOORAY! :)Â This is a view from our front yard. What a day for Space Shuttle Discovery to take off!Â The last 2 scheduled departure dates were no-go due to weather.Â I woke up this morning thinking it justÂmay happen today!Â However, it’s partly cloudly and there is currently some light rain at my location. So now I’m looking at radar and NASA TV.Â The clouds are rather spotty and the sky is blue at the Cape, so keeping fingers crossed that all goes well! If the clouds move out quickly, we should have a clear view of take-off in less than 1 hour. Today I have added another link to the Pro-Reason section of this blog for Zigory. eh… I just couldn’t bring myself to say “time flies”. But that’s the essence of what I am thinking right now. Before it gets too warm to play in the garden, I will be heading out to kill aphids, ants, and avoid snakes. Today we expect temperatures to reach around 90 and there hasn’t been a hint of rain for weeks. Certainly this hurricane season will make up for that, so I won’t complain. Click here for more information on the 2006 Season Hurricane Forecast. Joshua Sharf will be on the radio this afternoon/evening from Denver to discuss bloggers reactions to what’s happened after Hurricane Katrina.